Silly names, late arrivals, can Acer cut it in the mobile market? The Acer Liquid Glow and CloudMobile were announced way back at the start of the year, but they are only now making their way to market. Online retailer Expansys says it now has stock of the black and white versions of the Acer Liquid Glow, available at just £147.99 SIM-free. For your money you'll get a strong array of specs, including a 3.7-inch display (480x800), 1GHz single-core processor, 512MB of RAM, 1GB of internal storage, 5MP camera with LED flash, Android Ice Cream Sandwich, NFC and microSD slot. On paper, the Liquid Glow is a decent handset and takes the fight to the likes of the Huawei Ascend G300 and Samsung Galaxy Ace 2 – but we'll reserve judgement until we get the handset in and put it through our in-depth review process. 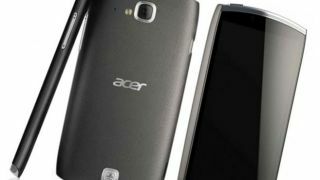 Expansys also has the Acer CloudMobile up for pre-order on its site, with an asking price of £284.99 for the 1.5GHz dual-core handset, which sports a 4.3-inch 720p display, 8MP camera and Ice Cream Sandwich. According to the retailer, stock of the Cloud Mobile will arrive in September – although there's no official word on this yet, so it could well be subject to change. We've contacted Acer to get some clarification on the availability of both handsets, and we'll update this article once we hear back.